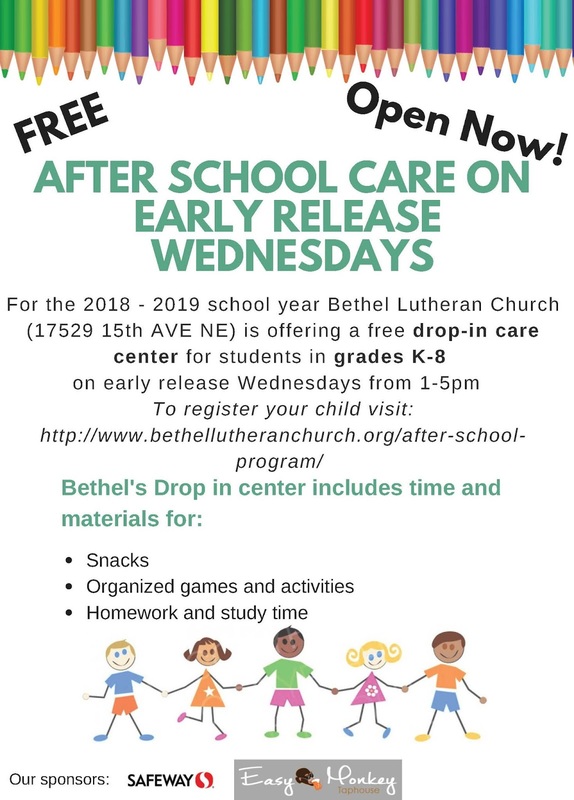 Bethel Lutheran Church (17529 15th Ave NE) is offering free, secular drop-in care for students in the Shoreline school district on early release Wednesdays. Drop-in care is a available from 1-5pm on Wednesdays. At Bethel, students will receive a snack, the opportunity to participate in activities and crafts, and have supervised homework time. We have some awesome high school volunteers who are helping provide care as well staff members who will be supervising and creating programming. Starting with this school year, the Shoreline School District is releasing K-8 students early on Wednesdays so teachers have time for meetings, planning, work sessions, and other activities.